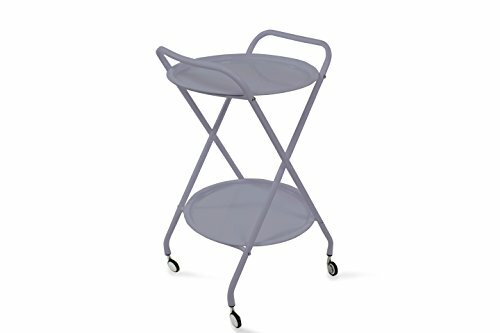 A unique take on a bar cart, this 2-Tiered Tray Trolley is like a compact version that doesn't limit itself to just busing drinks. The ingenious design features two round steel trays with lipped edges that are stacked atop a retro steel frame. The handles are built in and easy to push and pull while the casters make moving around a breeze. Compact in size, it's perfect for challenging spaces both indoors and out. Constructed with a durable powder coated steel, the sturdy trolley is not only tough, but cute to boot. Super easy to clean and minor assembly required. If you have any questions about this product by jamesdar, contact us by completing and submitting the form below. If you are looking for a specif part number, please include it with your message.